No new puzzles this time but an answer to a long standing rumour obtained through the use of Internet sources. Members who are also members of Air Britain may be aware of the AB-IX forum for posting information requests. This is however only open to such members. Another forum is at www.pprune.org . Originally founded for those active in the aviation industry (pprune = Professional Pilots Rumour Network) it also has a sub-section for aviation history. Incidentally the site name is also a reference to the character Pilot Officer Prune, invented in WW2 as a cartoon character for RAF training memos. I displayed a few old BOAC and Heathrow cards in response to someone who was asking about the first LHR public enclosure. 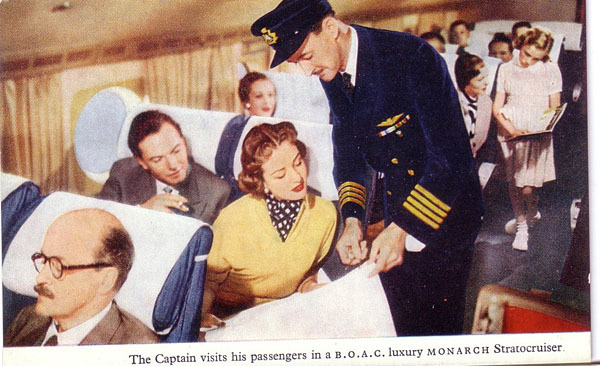 One of these was the BOAC Stratocruiser interior shot of a pilot and passengers. Now there has been a long standing rumour that this was modelled by actor David Niven early in his career. I have always been a bit suspicious of this as it seemed that he was probably not the only person in the late 40s to have that kind of moustache. You often see in PC dealers stock that any card of “ man with moustache + aeroplane” = Howard Hughes, “any woman in 30s dress + Aeroplane = Amy Johnson”. Anyway as a result of posting the card image + the supposed Niven connection, a guy from Canada replies to say that it is in fact his father , one Capt William L Stewart. So I guess we can also say that the passenger sitting in front of him is not Vladimir Ilych Lenin either. Incidentally at least one P/O P rune cartoon was reproduced on an After the Battle series postcard.